Are you looking for another adventure in Ecuador that will take you off the beaten track to explore the beauty and magnificence of the landscapes of the country that have remained untouched by development and modernization? This little known and breathtaking trek will give you the opportunity to spot the evasive Andean Condor as we explore this mysterious region of the Andes. Visit the majestic Altar Nature Reserve with its impressive collapsed crater and yellow lake located within the most stunning paramo scenery in all of Ecuador. Inspired by a French traveller named Marina Digabel, together we paved the path that was originally done in 2 days now into a somewhat comfortable 3 day program:) Or go super comfort with our 4 day program. We go south from Quito in local transport to Riobamba and have lunch, next we go east to the Hacienda Releche, a dairy farm where we will enjoy home cooked dinner. In the evening we relax and go to bed and get up early the following morning to begin our journey to El Altar. 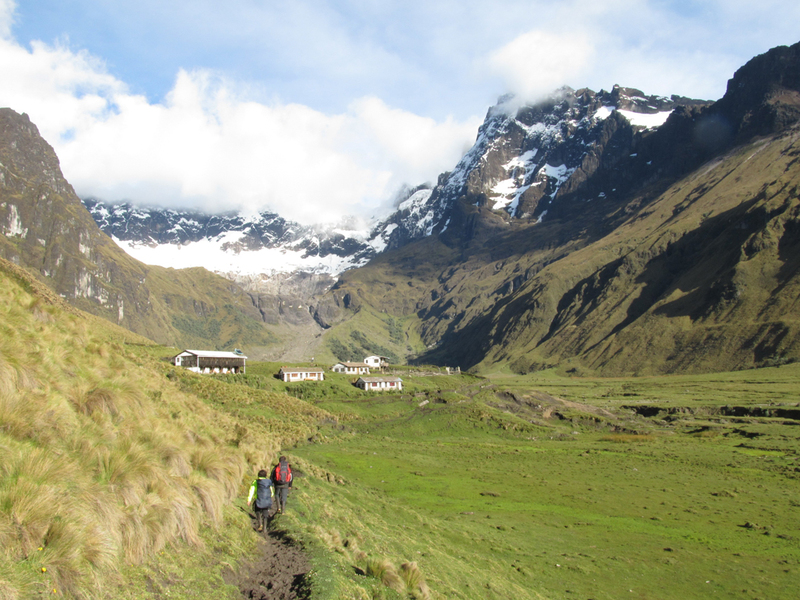 After a wholesome breakfast, we will horseback ride through the valley to 3,900 m. We will be able to observe the incredible changes in vegetation due to the increased altitude. Some of the more striking flowers we will find will be the Andean Orchid, the beautiful Chuquirahuas and Muyas that flowers only in grassy paramo fields. We will arrive early afternoon at the Italian camp and enjoy a hearty lunch. If the weather is good we will hike to the Laguna Amarilla which takes approximately 1-2 hours or just call it a day and enjoy the surroundings. After breakfast, we will hike upwards to 4,200 meters where we will reach the extinct crater known as Laguna Amarilla. Vertical walls and amazing glacier formations surround this incredible yellow lake. After lunch, we will get back our horses and return to Releche. Will walk to La Candelaria to get transport back to Riobamba and catch the bus back to Quito.